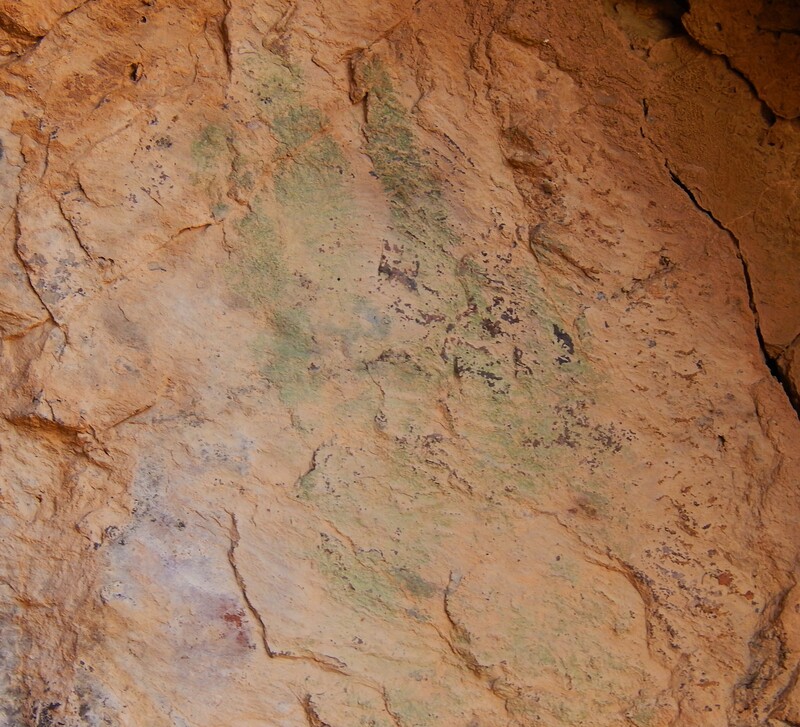 Visually there is not much here but when you think about it, this is the handprint of a person that was at the Newberry caves at the time of this ancient bighorn sheep hunting cult was in its prime. Newberry cave was not a tomb or burial site. What was there, was the physical remains of a human- bighorn sheep relationship that was uniquely specific to time and culture. This relationship, as it is revealed in the Newberry cave, was a predator- prey relationship steeped in technology, art, and hunting magic. One of the first things we need to understand about this site is how the forces of erosion played out on a geological timescale. The Newberry cave is situated on the east side of a waterfall measuring perhaps 50 feet or more. The cave itself is above any possible water level and yet below where the water spills over the top. This area below the waterfall I refer to as the arena it is in shade much of the day and parts of it are in perpetual shade. This aspect is crucial to understand this site. The primary structural component of this site is a wall of very hard rock that resists erosion. The rock beyond this point has eroded away faster so we have a drop or waterfall. Of course this is not a unique structure in the desert. Once this process started, large rocks would pour over the top of the waterfall during flash floods and impact the ground below thus pounding out a depression. Then the water and smaller rocks with far less energy would flow from there down the rest of the canyon. Sometimes small amounts of water would collect in this depression and then freeze and break the rock below the waterline, carving out this place even more. This process does not happen just beyond the depression because there is little or no water being held there to freeze. So, between the pounding rocks and cycles of freezing and thawing this depression erodes relatively fast, making it the center for the eroding force for the entire canyon. Presently this depression, or what is often called a tinaja, does not hold water, but this condition changes throughout the centuries as does the force and the intensity of erosion. One must also take into account the natural qualities of the rock at the bottom of this waterfall. If it is flawless without cracks it will tend to hold water better. But if it is cracked and is porous the water just seeps into the ground, sometimes within minutes. However when conditions are right these cracks and flaws get clogged by small organic debris such as decomposed plant matter and clay. With conditions like this these depressions or tinajas can hold water for one or two months. This may be with clear cold water due to the fact it rarely if ever received any direct radiant energy from the sun, thus reducing evaporation and the growth of algae and moss. Now with this basic knowledge of tinajas we can speculate on the condition of the one next to the Newberry cave through time and apply our knowledge of climate and the artifacts in the cave. While this idea is speculative I think it’s not only plausible but the most likely scenario. We can start with the fact that this tinaja existed for ages, long before the first human set foot on the continent. Another important fact in understanding this particular tinaja is understanding the ground above it. For the most part it is composed largely of broken rocks that decomposes to a relatively poor soil for growing plants. I believe this poor soil is crucial to understanding this tinaja and the activities of the desert bighorn sheep and thereby the artifacts in the cave as well. Prior to the little pluvial age there was a relatively steady flow of rocks and gravel grinding out this tinaja. At the onset of the little pluvial the increase rains would have increased the flow of rocks and gravel grinding out this tinaja for some time. Then as time went on due to the increase in rain, grass and other plant life took root on the slope above the tinaja and slowed the flow of rock and gravel over the waterfall and into the tinaja. At the same time there would’ve been an increase in the flow of decomposing leaves and grasses and other fine particles. This would clog the cracks and other imperfections in this tinaja to the point where it was watertight. This water then focuses the activity of the desert bighorn sheep and the human beings that hunted them to this place, especially in the summer time. Then when the little pluvial age ended this process reversed itself. So from a human perspective, long before the bow and arrow was invented, this tinaja no longer held water. While the lack of water in this tinaja had little effect on the overall population of desert bighorn sheep in the Newberry Mountains, the end of the little pluvial did. This is most evident in the numerous abandoned and weathering game trails throughout the Newberry Mountains. When we tried to understand the Newberry cave and its adjacent tinaja in a similar manner as with the other springs and water sources. We find that these other water sources did not have a cave to preserve the physical remnants of this environment or its human artifacts. With these two attributes so close together we find that the Newberry cave and tinaja were a uniquely powerful focus point in the environment for both desert bighorn sheep and people alike. The power of this environmental focus point infuses the these artifacts and environmental material found in this cave with a greater importance than if they were found elsewhere. A great deal of the purpose of this article is meant to illuminate this fact. One of the often overlooked components of this record is ancient trails around this site that are both human and bighorn sheep in origin. These trails represent the activities and psychology of desert bighorn sheep and people through time, and so they are important clues as to what went on here. Part of understanding them is understanding the forces of time and erosion on them. The only one that has any current use is a bighorn sheep trail on the north side of the two large rocks by the cave entrance going up the talus slope to the east. Over the years I have seen some use on this trail and no doubt it is sheep coming into the deep shade to either cool off or take advantage of the leafy green plants that sometimes grow there. When one takes this trail to the east you quickly find yourself at one of these volcanic ash deposits that is a mineral source for the bighorn sheep. It seems to me that it has been used so intensely in the past that it’s affected the pattern of erosion in that particular area. This of course is no longer ongoing by the relatively small population today, but the residual effects continue. There are two other deposits close to this on the other side of the canyon that also look as though in the past the bighorn sheep use them to the point where it affected the way they were eroding. There are also numerous yet faint game trails on some of the talus slopes above and around the Newberry cave that are testimony to a much larger population of desert bighorn sheep in the past. There are other mountain ranges where you can see an active game trail system from a large and vibrant population of desert bighorn sheep, in particular the Marble Mountains, which has many environmental similarities to the New berry Mountains. While not precise it does give you some idea of the population density through time. There is a remnant of what is most likely a human trail, though making this determination is less science and more art. The remnant of this human trail starts on the west side about half way up the alluvial. Where there is a small gap in a natural rock wall. You really can’t tell where the trail goes on the lower side of this wall but I suspect that one time it went down to the village site. That is at the small hill that sticks out into the ancient oasis in the flatlands. This hill has a few bedrock mortars that would seem to indicate the presence of women as well as a small glyph site near the top of this hill that would’ve made an excellent observation point. Going up from the gap in the rock wall it is easy to see the trail, from there it drops down toward the wash. At this point there are various parallel trails going up the west side. Then where the canyon narrows, the trail begins on the other side of the canyon Southside. If you know where it is, it’s easier to walk there, however most people today walk in the middle of the canyon. I know of no artifacts or glyphs along this trail system but perhaps they were there at one time. Sometimes these ancient human trails had a ceremonial component to them. There seems to be no corresponding trail system on the east side of the wash. But due to time and erosion if it were there it may have been washed away a long time ago. Another interesting and valuable part of this ancient record are the pictographs around the cave entrance. While there are bigger more elaborate pictograph sites in the desert this art form is rarely preserved and then only where there has been some sort of permanent shelter. What is unique about these pictographs is the large volume of painted perishable artifacts associated with them. While we will never know for sure I believe that the arena that is the area below the cave and around the tinaja was probably covered with pictographs at one time. These other pictographs would’ve been exposed to the weather and have since been washed away. There is a tinaja that has some structural similarities in the Rodman Mountains called Deep Tank. It is full of petroglyphs and many of them show signs of having been painted*. Judging from the many painted perishable artifacts in the cave these people used paints extensively. So it’s reasonable to conclude that there one were more pictographs at this site. If the arena was painted extensively with numerous color pictographs it would add to the drama and emotional power of this place. In many ways this arena could also be considered as an altar where the drama of life and death was played out and a man’s self-worth was defined. Among the beautiful and elaborate symbolism of their culture and religion. For instance many Native American cultures have their genesis for both people and animals emerging from the ground or caves and of course water in almost all religions throughout the world are related to renewal cleansing and rebirth. One should also consider the mineral sources here. As there are still Native Americans that retain some traditions related to salt trails and salt songs. So here the Newberry caves we have a convergence of these three major elements or to the physical and spiritual culture of these ancient people. One can only imagine the psychological and spiritual impact of the young hunter emerging from the earth and casting a spear to make a kill bighorn sheep at a site with water and minerals. All this close enough to a major village that everybody he knew could partake of his kill. Within the laws of nature nothing is too wonderful to be true. This first video should is an introduction to the content contained within the whole series. The knowledge and ideas presented, though not scientific, are based on facts learned through experience. Take a journey away from a modern means of approach to the natural world, and momentarily return to a more natural thinking of the world, our minds and bodies. This particular book offers an insight into the desert southwest’s past. It contains an official publication of an archaeological study. It can be a bit cumbersome to someone other than an archaeologist, but it is a study worth reading.